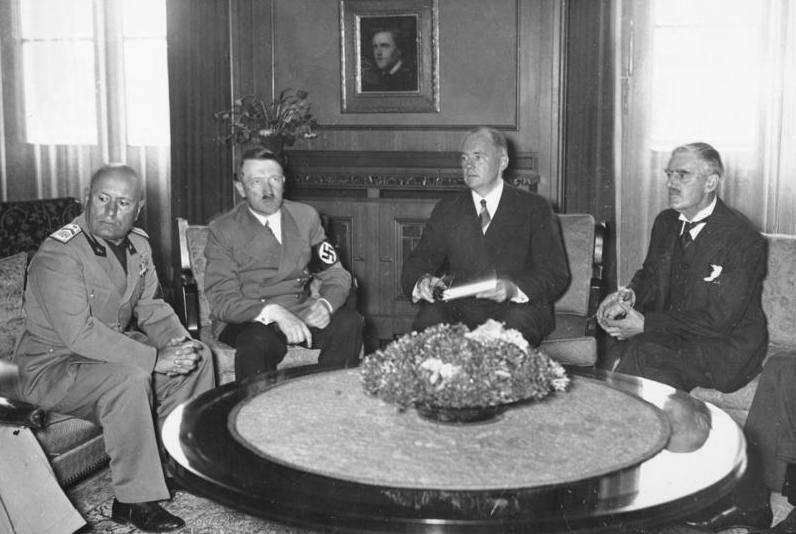 On this day—with negotiations continuing through the night and on to the next morning—in 1938 Italian il Duce Benito Mussolini, France’s Prime Minister Édouard Daladier and British Prime Minister Neville Chamberlain met with Adolf Hitler at a conference in Munich to lend a façade of legitimacy to Nazi Germany’s long-standing goal of annexing the newly-coined territory of the Sudetenland, lands with an ethnic Germany majority along the borders with the also freshly minted Czechoslovakia. Despite the conspicuous absence of any representation of the Soviet Union or the Czech government or outlandish claims including Czechoslovakia being accused of plotting to exterminate the Sudeten Germans and being characterised as a vassal state of France created for the express purpose of being a base of operations for the French armed forces to overrun and finally vanquish Germany, afterward Chamberlain praised the summit as heralding “peace in our time,” though many others (including president Edvard Beneš and the Czech people) saw it as a dangerous and precedential tactic of appeasement. German diaspora who had mostly set up trading operations in Hapsburg lands suddenly found themselves in foreign lands after World War I and the dissolution of the Austro-Hungarian Empire, bereft of much of the freedoms and privilege (reportedly) accorded to Prussian subjects prior. Because of the nature of their import/export business, these Germans living abroad were more affected than the native populations by the economic downturn of the Great Depression and their demands for autonomy—with the backing of the German government—became more and more shrill.